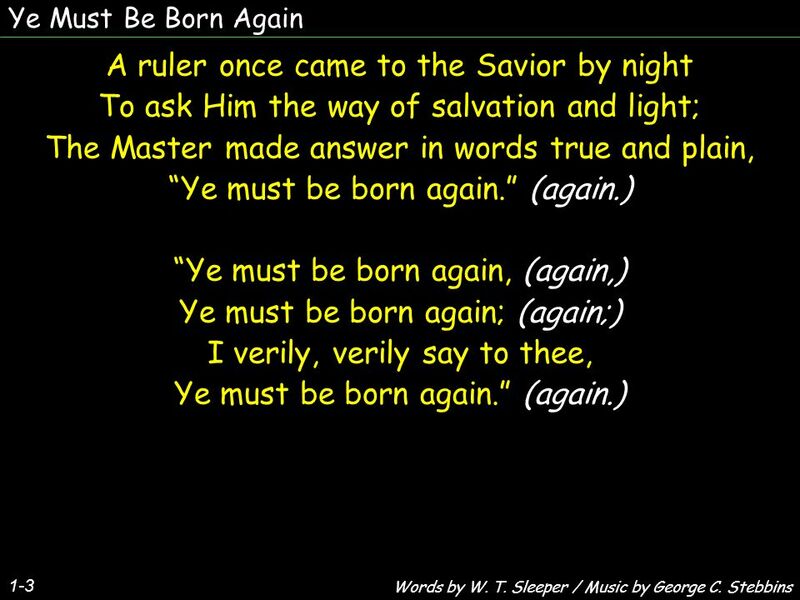 Ye Must Be Born Again 1-3 A ruler once came to the Savior by night To ask Him the way of salvation and light; The Master made answer in words true and. 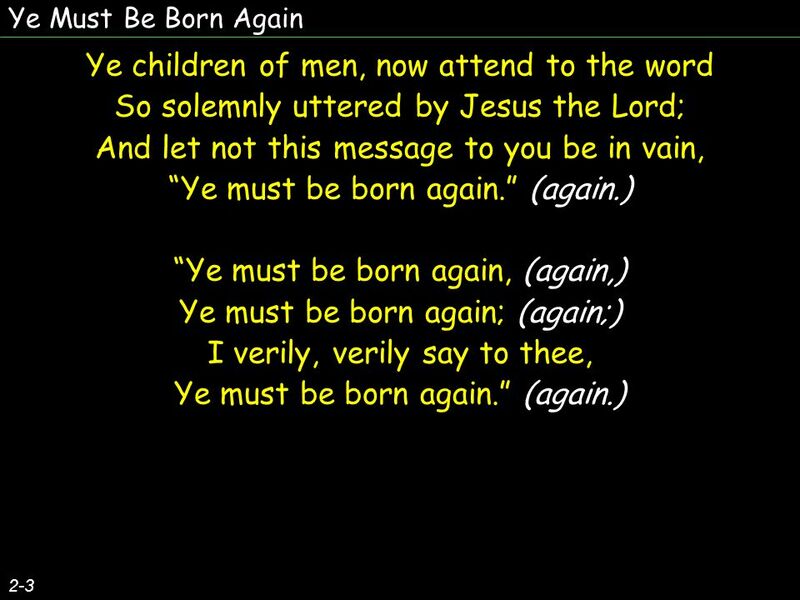 Download ppt "Ye Must Be Born Again 1-3 A ruler once came to the Savior by night To ask Him the way of salvation and light; The Master made answer in words true and." O Come, All Ye Faithful v.1 O come, all ye faithful, joyful and triumphant; O come ye, O come ye to Bethlehem! Come and behold Him Born the King of angels! Praise The Savior, Ye Who Know Him! Praise the Savior, ye who know Him! Who can tell how much we owe Him? Gladly lets us render to Him All we are and have. O Come All Ye Faithful. O come, all ye faithful, joyful and triumphant; O come ye, o come ye to Bethlehem! Come and behold Him, born the King of angels! Oh, come, All Ye Faithful. Oh, come, all ye faithful, Joyful and triumphant! Oh, come ye, oh, come ye to Bethlehem; Come and behold him Born the king. O Come all Ye Faithful O Come All Ye Faithful Joyful and triumphant, O come ye, O come ye to Bethlehem. Come and behold Him Born the King of Angels; O. “O Come All Ye Faithful”. O Come All Ye Faithful Refrain O come let us adore him Christ the Lord. 1. Let every heart rejoice and sing, Let choral anthems rise; Ye aged men, and children, bring To God your sacrifice; 1 - Let Every Heart Rejoice and Sing. Mighty, Mighty Savior Mighty, Mighty Lord Mighty, Mighty Savior You Are My God. Mighty Savior. Mighty mighty Savior, Mighty mighty Lord; Mighty mighty Savior You are my God. Nicodemus and the Samaritan Woman The gospels contain many intriguing and profitable examples for our consideration. Among these, we find the two examples. Behold The Lamb Of God Behold the Lamb of God! O Thou for sinners slain, Let it not be in vain That Thou hast died. Thee for my Savior let me take, My. Christ The Lord Is Risen Today Christ the Lord is risen today, Alleluia! Sons of men and angels say: Alleluia! Christ the Lord is risen today, Alleluia! Christ The Lord Has Risen Today 1-3 Christ, the Lord, is ris’n today, Hallelujah! Sons of men and angels say, Hallelujah! Raise your joys and triumphs. Low in the grave He lay Jesus our Saviour Waiting the coming day Jesus my Lord.